My eldest girl is happy if she wins a couple and I think my boy lets her win sometimes so she will keep playing. Not that I have much to say to this (non-parent) but if he truly has this mindset at that age I must applaud him for being clever about how to use occasional self-sacrifice to further his own interest. But I understand the general tone here. The Industry-focus as a whole has shifted. Nintendohard is no more. That Games like Dark Souls thrive is a statement to the need of (more adult?) gamers for the challenge which isn’t en vogue anymore because instant gratification and “feel good” empowerment drives sales. Sure back in the old days, we all had our "throw controller into wall/TV/out of window moments as well but we needed to learn to live with our failures because…there was no alternative. Out of necessity (storage space on disks/roms) hard games were a feature everyone had to work/live with. I run into the hating to lose thing a little with my five year old girl, but it isn’t terrible. It is mostly an extension of her perfectionism. We try to control it by always pointing out that no one will want to play with her if she acts that way, and it (usually) helps stop a fit before it starts. Mire, do you wonder if you started with video games too early? I don’t mean that in an insulting fashion, I just know that I let my nephew start watching at 2 and in retrospect I wondered if it was too early both from a content and attention span standpoint. If he could properly process that much stimulation. I do think I let them start too early but for reasons other than attention span and things like that. O wanted to keep them away from video games just on principle but that failed quickly for a number of reasons. As for my son, he’s got some other behavior issues that kind of go hand in hand with his poor losing, so I don’t really associate that with screen time or video games. Man, being a parent is hard! Where is the manual? Man, being a parent is hard! Where is the manual? My parents always told me the manual was attached to my toe when I was born. My kids all showed up without one, though. I started the Tails of Equestria RPG with my children (6 and 4). 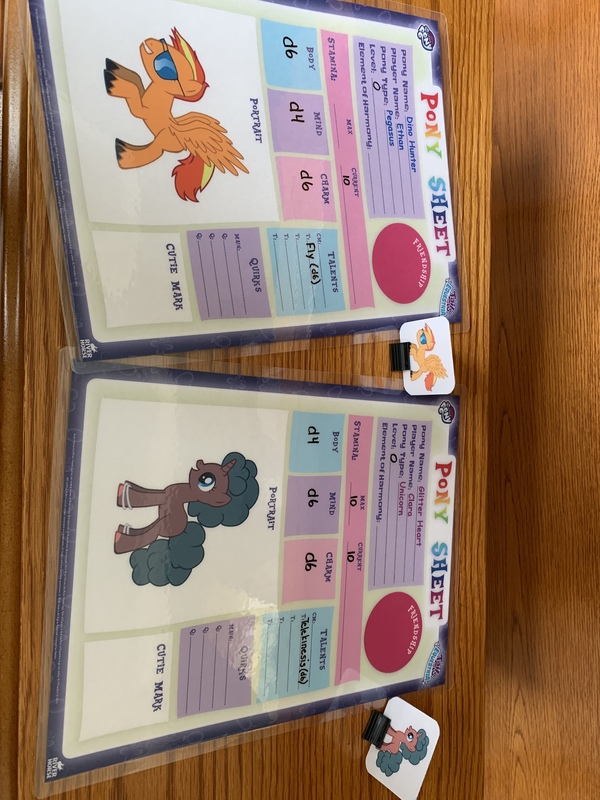 I printed out some blank pony sheets rather than using the provided characters so that my kids could create their own, or at least decide their name, class, and colors. I found it a bit funny that my daughter, with a pack of about 50 colored pencils, chose so color her unicorn, Glitter Heart, various shades of brown and olive. The starter kit didn’t come with pony cartoon instructions, though, so I copied the stats and abilities from the pre-made ponies. I’m having a bit of heartbreak with the Tails of Equestria RPG. The kids loved it when we first played, and were super enthusiastic about getting the movie sourcebook so they could play as more varied characters. But my son, who’s been a bit oblivious of other humans up to now, happens to be in a class with more jerks than he has in the past. They’re doing the usual teasing for whatever’s nonconformist which I recall from my youth, but thought based on previous years was largely absent in his school. So, now, he’s terrified that they might find out that he played and enjoyed this game (or, presumably, watched and enjoyed the show), and is no longer willing to. That is certainly tough and I don’t blame him because I can remember a time when I was like that. Out of curiosity, what book did you get? The products are not easy to find and the older starter set (Curse of the Statuette) is near impossible to find. We are playing The Dragon’s bounty. I may grab a core rule book tomorrow for my own enjoyment as I figure once I know the real rules pretty well, I can DM plenty of games as long as my kids want to keep playing. Also, I just read that WizKids is releasing a bunch of miniatures this year for Hasbro titles like Transformers and MLP, which means I’ll be able to pick up some minis and paint them as my kids’ characters, which is kind of fun. Now here’s hoping they stay interested. We have the main hardcover, bestiary, movie sourcebook, Festival of Lights, and Judge Not By the Cover, most purchased at Millennium Games in Rochester, NY (which I’m told took over the old Crazy Egor’s location, if you remember their ads from the back of old issues of Dragon Magazine). I wanted but never found Curse of the Statuettes, mostly for the DM screen, as there are some rules I thought of little enough impact that I always had trouble caring about them enough to remember. Ha! Want it for the screen, too! Pay attention, many of their products are digital. The statuette adventure is only digital, at least from what I saw. It isn’t the easiest site to navigate on my phone. EU vs. USA might also be an issue; not sure. Hmmm, did not realize it was digital. They don’t really make that clear on the site, and the prices are high enough that I assumed print. Achtung, biffpow! Ok, now that I had some time, I went all the way through into the checkout procedure, and based on my US address, I would be getting a physical product (for Curse of the Statuettes and random other sets) with DHL shipping from the UK. Curse’s product description notes the inclusion of dice. So I think these are physical copies, although shipping to the US is a tad pricey. If you were ordering a lot, it might make it worthwhile. Interesting. Keep us informed. I’m most interested in Curse of the Statuette for the screen. Of course, the adventure would be nice, but those seem easy enough to find. Slightly on the same subject, has anyone played any of the Star Wars RPGs? Are any of their adventures more or less written so running the game is easy? It’s not that I’m not imaginative, I just have an easier time keeping the game running when I’m reading a script. I had never thought I’d put this much thought into, or write this much, about My Little Ponies. Kids make us do weird things, though. Anyways, I’m attaching a link to a site that lets you design your own pony. I’m using the colors that my kids colored their pony sheets to make ponies that look like those they envisioned. I think I’m going to make pony sheets with these generated ponies on them and then laminate the sheets. I’m also going to print out small versions that I laminate as well and turn into standees for the game. I used the site I linked to above to re-create my kids’ crude coloring. As an added benefit, I was able to make my son’s look like a mare, so that’s nice. I then copied the created pictures into a pony sheet. I laminated the sheet and will use a vis-a-vis wet erase marker to track stats. I also printed out small versions of the ponies and laminated them, as well, for standees. I would probably follow you right down this rabbit hole. For the second point it doesn’t help that most of his close female friends are all moving this summer. All that’s going to be left are the aggressive boys in the neighborhood, and the (much better) cub scouts. In an odd spot with my older daughter. She gets video game time on the weekends, but hasn’t been interested in using it of late. She talks about Pokémon or even expresses interest in trying Super Mario RPG, but when a weekend afternoon rolls around she says she would rather spend that time playing with me with her toys, or doing a game of Monopoly with me and her mama. I am thrilled, but also a little disappointed. It’s an odd place to be in. Yeah, she has been fascinated with board games since about 3. Mostly we play the Disney Princess version of Monopoly Junior, Sequence for Kids, and an old VHS game called Flash Match Junior. I would hate to see her miss out on video games entirely, but you are right that the odds are good she’ll spend much more time interested in it than she will being interested in playing toys with me.